Beautiful Picture: Fake Bling. Beautiful Picture: Fake Bling. Home » Jewellery » Fake Bling. My mum came home this evening sporting some new bling. and when she showed me these that she picked up in a little boutique-y shop. I wanted them BADLY. 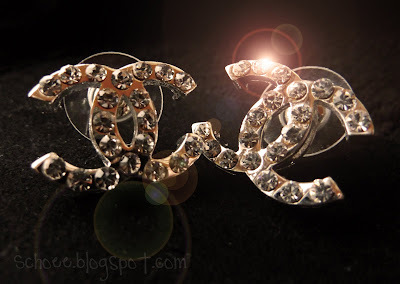 Because at first glance, i actually thought she'd dished out big moolah on some diamond Chanel earrings. My mum is in no way chavvy. But i am obviously aware these earrings may be targeted by a young chavvy girl, to accompany her trackies & trainers. If you wear them right...why would anyone suspect you're wearing £8 earrings instead of the real thing? I do think that you should all have a pair of these..and if it means me going out, buying them for you and posting them...then i surely will! That is an offer too! Sometimes a fake can be just as satisfying...well..maybe not, but it will definitely suffice.